Contrary to what was reported yesterday, the Red Sox announced that they will non-tender Andrew Bailey, according to MLB Trade Rumors and several tweets. Bailey was part of the trade that sent Josh Reddick to Oakland. The plan was for Andrew Bailey to become the closer, but that didn't work out, as Bailey was wildly ineffective in 2013 and had to undergo shoulder surgery. It was also reported that Ryan Kalish will also not be tendered (see below). Contrary to reports, the Red Sox announce they will not tender 2014 contracts to Andrew Bailey and Ryan Kalish. Both become free agents. #RedSox today announced that club will not tender 2014 contracts to Andrew Bailey and Ryan Kalish. As a result, both become free agents. Both players are now free agents. 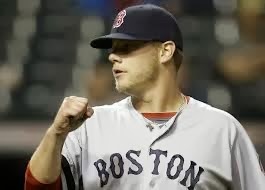 The Red Sox could have used Bailey as trade bait next season if they had retained him, but they decided to let him walk. Thoughts? Hit me up on Twitter or leave a comment.